Say You’re sorry is a harrowing, confronting tale, that will haunt you long after you have finished the book. ‘The Bingham Girls’, as they are called by the media, are Piper Hadley and Tash McBain. When the story begins, they have been missing for three years and the police stopped looking for them long ago assuming they ran away and may even be dead. The reader knows from the opening chapter that they have been prisoners for three years, at the mercy of a brutal and sadistic man who is known only as George, and Tash has managed to escape, but we don’t know if she is alive or dead. Piper tells their story as if we are inside her head, but it is suggested that these glimpses of their ordeal are also written in her dairy. But we only get random insights into what has happened to them and the most critical memory – the night they were abducted – is left to the very end of the book so as not to spoil the startling revelation. Robotham skillfully keeps you guessing right to the very end about the villain’s identity, and like the hero, Joe O’Loughlin, we make several incorrect assumptions. What makes this story so compelling is the voice of Piper Hadley, the eighteen year old victim. 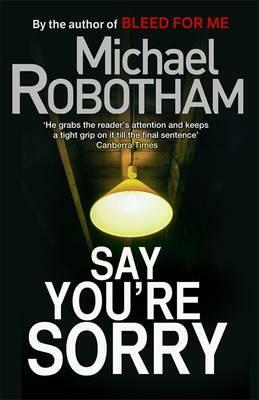 Her reactions to the situation and her captor are complex and entirely believable; Robotham has clearly got into the head space of teenage girls. Charlie, Joe O’Loughlin’s petulant and sharp-tongued daughter is every bit a realistic painful yet vulnerable teenager, but considering the horror that Charlie has been through in a previous book (Shatter) it’s amazing she hasn’t gone completely off the rails. Father-daughter relationships are very much a theme of this book: O’Loughlin’s awkward relationship with Charlie, the very different fathers of the two missing girls, the over-controlling father of the girls’ friend, Emily, and so on. Tash McBain, Piper’s flirtatious, beautiful and rebellious friend who, at fifteen, torments men and boys with her sexuality, is the cause of a fight between two boys, which leaves one in a wheelchair for life. She appears callous and oblivious to the pain she causes. The men who assault Tash believe she gets what she deserves, echoing the age old cry that a whore who is raped and murdered, deserves no sympathy. But sympathy is absolutely what you feel for Tash as you learn more about her ordeal, and utter loathing for the men who brutalise her. Apart from his intriguing plots, I love the fact there is no simple way to regard his central characters. Even the good guys are very flawed, such as DCI Drury. He’s a married man having an affair. He gave up searching for the girls years ago. He decides Augie Shaw is guilty and ultimately is responsible for what happens to him. As you would expect in crime fiction, there is lots of tension: not just because of the ticking clock as we fear Piper will not survive, but tension between O’Loughlin and Drury, tension between O’Loughlin and his daughter and so on. I am delighted to say that Vincent Ruiz is in this novel and adds his magic touch of dry humour. But O’Loughlin is most definitely the hero of the story and is forced to do something at the end which he abhors. I have to say I am surprised it took him so long, but he does it, and, as a result, there is hope for both him and for Piper. This is a cracker of a thriller!